Road Safety Authority officials have confirmed that the authority has failed to follow its own Pedestrian Road Safety Action Plan, which said it would work with city, town and county councils on lowering speed limits. Responding to a Freedom of Information request from the Community Road Safety Action & Information Network (Cosain), the RSA confirmed that they have no record of advising or recommending the implantation of lower speed limits to local authorities. 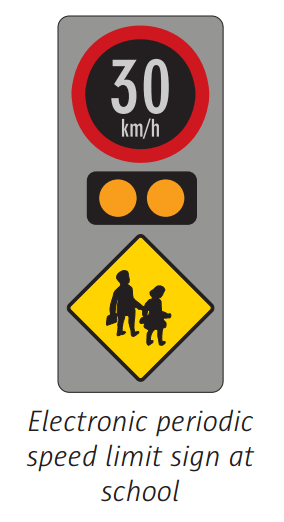 While the RSA said it was “supportive” of 30 km/h per hour speed limits and other measures such as traffic calming, its record on the issue will likely fuel the idea that the agency is overly focused on the behavior of people who cycle and walk, rather than tackling poor driving and inappropriate speed by motorists which kills. But despite the proven safety benefits, there has been little usage of lower limits since they were introduced in official guidelines. It has taken the death of six-year-old Jake Brennan in a housing estate in Kilkenny for action for the department to in any way push councils to use 30km/h limits. His family — led by his mother Rosie Brennan — set up the Jake’s Legacy campaign, which is credited for getting speed limit surveys and reviews. A spokesman for Cosain said: “The Department of Transport survey found that, ten years after the enabling legislation was introduced, just 1.4% of housing estates outside the capital have a 30 km/h speed limit, while only three residential areas in Dublin City have been designated low speed zones: Marino, Irishtown and adjacent to the South Lotts Road”. 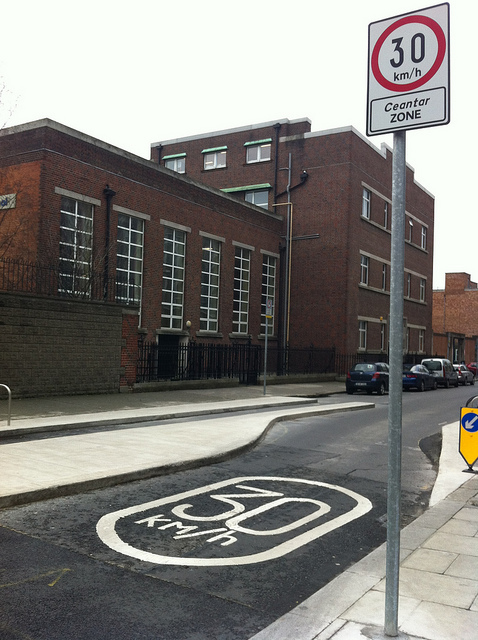 The use of 30km/h in Dublin outside these areas is limited to the city centre, a number of lanes in Ballsbridge and time-based limits at a small number of schools (sign pictured above). Just 7 months before Jake’s Legacy campaign was set up, the Department of Transport published the 2013 Speed Limits Review. The action plan in its report treated 30km/h limits as experimental, despite the limit being in place in Ireland for over 10 years, and far more widely used in the UK and across Europe. The Speed Limit Review said: “Trial and Implement Quiet Lanes and Shared Space That proposals for Rural Quiet Lanes and Urban Shared Space (or Homezones) be developed and implemented and provide for very low Speed Limits such as 30km/h or 20km/h. Proposals to be supported by research and trials”. No independent road safety campaign were a part of the review, whose membership was dominated by officials from state agencies and councils. But motoring group, AA Ireland — who opposed 30km/h zones in Dublin — were members of the review. Cosain say that Ireland’s position is out of sync with Europe. Edinburgh: Councillors agreed this month to expand its 20mph (32km/h) limit zones to 80% of Edinburgh’s streets and roads, including the whole of the city centre and many main streets. London: The 20mph limit (32km/h) is already on 19% of London’s roads and London boroughs are lining up to follow the lead of Islington, Camden, and the City of London it having the speed limit as their borough-wide default speed limit. Paris: After an extensive expansion in 2013, over one third of the city’s streets were 30km/h or lower; and last year the city’s mayor said the plan is now to extend the limit to all streets expect major thoroughfares. 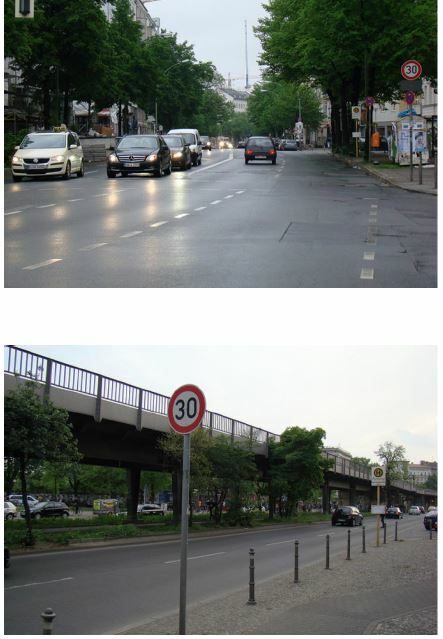 Berlin: 30km/h on many mid-sized road (as pictured above) and lower speed limits have been introduced on some side streets. Barcelona: Went from having around 10km of 30km streets in 2006 to having 300km of such streets by 2010. According to a survey cited by the European Transport Safety Council, 38% of the Swiss population lives in 30 km/h zones. The Netherlands has 35,000km of 30km/h streets and roads. Well done Cosain and Cian! All of the quangos you mention report to Departent of Transport. Time for Minister(s) to issue binding Directions otherwise the catering for free-flow of motorised traffic will continue unabated. The windsceen-view of road safety prevails! is this because no council asked them orthey didn’t approach councils? They did not approach councils when they said they would.